To Vaccinate or to not Vaccinate? Immunizations have been a topic of debate this session, especially in the Senate. The House and the Senate both passed House Bill 2431, which would allow influenza immunizations to be offered to patients and residents of specified facilities on a voluntary basis based upon recommendations of the Center for Disease Control. The bill is now waiting for the Governor’s signature. The House passed HB 2518 which would give the Board of Pharmacy rule-making authority to permit a pharmacist or pharmacy intern to administer certain immunizations. This bill is currently pending in the Senate Health and Human Resources Committee. SB 537, HB 2945 and SB 359 would provide exemptions from mandatory immunizations. SB 537 was voted on in Senate Education this week; the committee approved the bill on a vote of 7-6. It will now be referred to the Senate Health and Human Resources. Delegates and Senators have varying opinions about allowing non-medical exemptions. Delegate Joe Ellington (R-Mercer), the chair of the Health and Human Resources Committee said that they’ve been through this year after year. Ellington is a doctor and he said he agrees with vaccinations, but the individual should have the right to decline it. "There are viable and reasonable exemptions from vaccinations,” he said. West Virginia requires vaccinations to enter Pre-Kindergarten, 7th and 12th grades. To receive a medical exemption in West Virginia, the child’s guardian must present a written request for an exemption from a physician, who has treated or examined the child, to the local health officer in the county where the child attends school. The request must include which vaccine and give reasoning for the exemption. Senator Patricia Rucker (R-Jefferson) is the lead sponsor on SB 537. “I’ve had many constituents, who are concerned about the ingredients in vaccines, come to me,” she said. She stated that 47 of the 50 states have religious exemptions, which is what she hopes to accomplish with her bill. “It is the medical establishments job to inform the public of the benefits of getting or not getting vaccinated. It’s the Legislature’s job to protect the freedoms of the individual.” According to the National Vaccine Information Center, West Virginia is one of three states that do not allow for religious or personal belief exemptions for immunizations. The only exemptions in West Virginia, California, and Mississippi are medical exemptions. Senator Ron Stollings (D-Boone), who is a doctor too, believes the state should keep strong vaccination laws and to him that means medical exemption only. “Vaccinations are probably the most important public health tool in the history of mankind,” he said. He stated that the benefits outweigh the risks. He said studies show that vaccinations do not cause autism; they protect highly contagious diseases. Research on vaccines are continuously being done. “Other states are trying to look like West Virginia,” Stollings said, in regards to the medical exemption only. California allowed exemptions until last year when they changed to medical exemptions only. House Bill 2300 would regulate the use of step therapy protocols by providing a simple and expeditious process for exceptions to the protocols that the health care provider deems not in the best interests of the patient. Senate Bill 16 would repeal a section of the code that provides a tax credit for wind power projects. Senate Bill 27 would permit home-based, micro-processing foods to be sold at farmers markets. Senate Bill 36 add sales of gasoline, diesel fuel and blended fuel to the list of products exempted from the Unfair Practices Act. Senate Bill 216 would prohibit the exclusion, modification or limitation of any warranty or remedy in the sale of used motor vehicles, specifically pertaining to "as is" motor vehicle sales. Senate Bill 219 would create a criminal offense to hold all participants involved in a conspiracy to violate the drug laws responsible. Senate Bill 243 would repeal statutory language authorizing a minor over age of fourteen years to nominate a guardian in domestic relation matters. Senate Bill 288 would double the penalties for child abuse offenses. Senate Bill 290 would allow distillery or mini-distillery operators to offer liquor for purchase and consumption on the premises on Sundays beginning at 1 p.m.
Senate Bill 308 would define legislatively that the administrative and law enforcement activities of the natural resources police officers of the Division of Natural Resources are directly related to the conservation and management of the state’s fish and wildlife. Senate Bill 339 would create a legislative coalition to study and report to the Legislature on chronic pain management in the state. 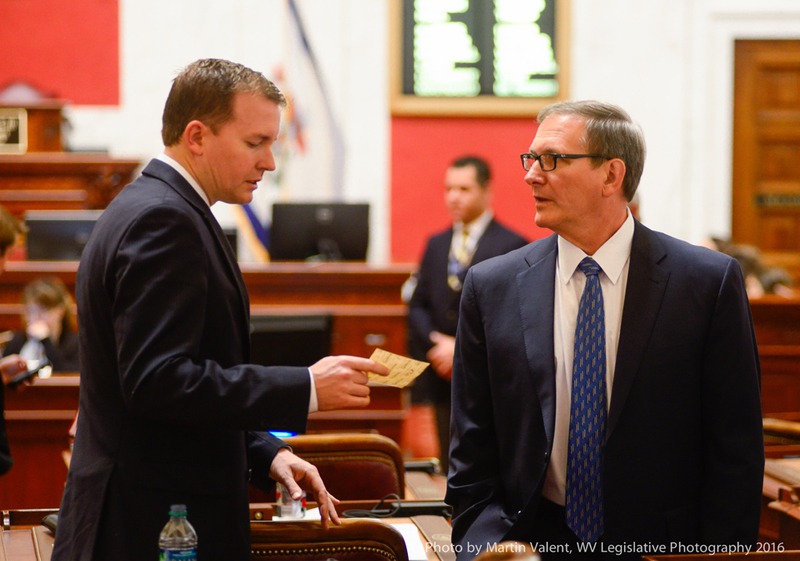 Senate Bill 341 would establish a West Virginia business growth in low-income communities tax credit. Senate Bill 360 would create a legislative coalition to study and report to the Legislature on diabetes in the state. Senate Bill 362 would permit the redirection of the deposit of revenues collected from certain surcharges and assessments on workers’ compensation insurance policies and derived from net terminal income funds by the Governor through executive order to the General Revenue Fund. Senate Bill 398 would create The Emergency Volunteer Health Practitioners Act to regulate the practice of volunteer health practitioners during an emergency and create a registration system that grants reciprocity to licenses issued to volunteer health practitioners in other states during an emergency. Senate Bill 414 would create the Division of Multimodal Transportation under the Secretary of Transportation and to combine the employees, equipment, assets, liabilities and duties previously executed by the Public Port Authority, the state Aeronautics Commission and the West Virginia State Rail Authority. Senate Bill 461 would exempt the West Virginia State Police from state purchasing requirements. Senate Bill 467 would increase the maximum bet permitted for limited video lottery terminals, remove restrictions on bill denominations accepted by limited video lottery terminals and fix the state share of gross profits from limited video lottery revenues at 50% beginning July 1, 2017. Senate Bill 468 would remove restrictions on where KENO theme lottery games may be played, specifically, games that utilize an electronic computer and video screen to operate a lottery game and communicate the results thereof, such as the game "Travel," and do not utilize an interactive electronic terminal device allowing input by an individual player. Senate Bill 472 would permit bear hunting with guides. Senate Bill 479 would allow sales of liquor by retail licensees after one o’clock p.m. on Sundays and transfer the authority to set the maximum wholesale markup percentage of all liquor, other than wine, from the commissioner to the Legislature. Senate Bill 480 would authorize local units of government to adopt local energy efficiency partnership programs and to create districts to promote the use of energy efficiency improvements by owners of certain real property, and provide for the financing of such programs. Senate Bill 499 would create the Debt Resolution Services Division within the Auditor’s office administered by the existing employees of the Auditor’s office. Senate Bill 500 would add language to the West Virginia Code providing clarity in the representation of cases relating to Medicaid fraud and abuse, as well as continue the fraud control unit in the Medicaid Fraud Control Unit of the Attorney General’s office after July 1, 2017. Senate Bill 523 would make statutory changes related to converting to a biweekly pay cycle from a monthly or semimonthly cycle for state employees. Senate Bill 524 would prohibit implementation of Common Core academic standards and require adoption and implementation of certain other academic standards for a minimum of five school years after date of implementation. Senate Bill 533 would provide that no wine or liquor excise tax will be collected on purchases of wine or intoxicating liquors in the original sealed package for resale, if the final purchase of the wine or intoxicating liquor is subject to the excise tax. Senate Bill 547 would generally modify fees to be paid to the Secretary of State. Senate Bill 548 would provide for the specific escheat of United States savings bonds and all rights and legal title thereto and define terms. Senate Bill 554 would create the crime of false swearing in a legislative proceeding and penalties for violators. Senate Bill 559 would permit limited video lottery retailers with more than one location to sell one or more of their operations to another person. Senate Bill 564 would modify the West Virginia Independent Living Act and provisions relating to the statewide Independent Living Council to conform to requirements of the federal Rehabilitation Act of 1973, as amended. Senate Bill 572 would require that elections for county surveyors be conducted on a nonpartisan basis and provide for the appointment and election of a new county surveyor if the office is vacated. Senate Bill 581 would make technical corrections to the Uniform Trust Code. Senate Bill 585 would strike the code section regarding locomotive power units and helper units. Senate Bill 595 would allow portions of otherwise exempt property that are being used for nonexempt purposes to be separately assessed and taxed for property tax purposes. Senate Bill 608 would clarify that lawful businesses or business structures operating in this state are unaffected by enactment of prohibitory legislation absent express language in the enactment prohibiting the continued operation of the business or use of a business structure. Senate Bill 620 would increase penalties for vehicles driving slow in the passing lane or for overtaking a vehicle or turning or making a lane change without giving a signal and clarify that signaling is required when changing lanes. Senate Bill 684 would correct existing incorrect references in the two sections relating to the West Virginia State Police. House Bill 2028 would allow a pro se plaintiff or petitioner to file a claim or petition against the state, a state officer or state agency in the circuit court of a county in which the plaintiff or petitioner resides or in which a claim arose, instead of only allowing such claims to be heard at the Kanawha County Circuit Court. House Bill 2447 would rename the Court of Claims the state Claims Commission, among other modifications. House Bill 2766 would establish a new special revenue fund to collect and remit moneys to the Adult Drug Court Participation Fee Fund in the state to maintain and administer the state’s adult drug court programs. Senate Bill 18 would require a new comprehensive statewide student assessment. Senate Bill 61 would Provide consumers sales and service tax and use tax exemption for certain services and tangible personal property sold for repair, remodeling and maintenance of aircraft. Senate Bill 76 would create the West Virginia Second Chance for Employment Act. Senate Bill 183 would transfer the Division of Forestry from the Department of Commerce to the Department of Agriculture. Senate Bill 419 would create special revenue fund sources for the Division of Labor to meet statutory obligations. Senate Bill 464 would eliminate taxation on annuity consideration received by life insurer. Senate Bill 486 relates to health care provider taxes. Senate Bill 535 would reorganize the Division of Tourism and rename it to the West Virginia Tourism Office. The bill also allows for increased flexibility to market the state with a more strategic and results driven approach. Senate Bill 538 would create special conditions of parole. House Bill 2828 would have decreased the number of strikes a defendant has in a criminal proceeding from six to four from a panel of potential jurors and increased the number of strikes the prosecution has from two to four. The bill was rejected in the House 40-56. Senate Bill 127 would authorize the Insurance Commissioner to issue a legislative rule relating to Adoption of a Valuation Manual. This bill was passed by the House and the Senate. Senate Bill 302 is a supplemental appropriation and it would supplement, amend, and increase appropriation for the Division of Human Service in the Department of Health and Human Resources for the designated spending unit for expenditure during the fiscal year 2017. The bill has been approved by the House and the Senate. It is currently awaiting the Governor’s signature. Senate Bill 306 would supplement, amend, and increase an item of appropriation in the aforesaid account for the designated spending unit for expenditure during the fiscal year 2017. The bill has passed the House and the Senate. House Bill 2519 would require the secretary of the Department of Health and Human Resources to enter into a compact to ensure payment for health care services provided to other states’ Medicaid participants. This bill was passed in the House and sent to the Senate for more consideration. House Bill 2808 would provide assisted outpatient treatment to individuals suffering from mental illness to prevent them from harming themselves or others, as well as to prevent the costs of inpatient involuntary hospitalization and costs of incarceration due to untreated mental illness. This bill was passed in the House and sent to the Senate for further consideration. House Bill 2857 would create the West Virginia Safer Workplaces Act. It allows employers to test employees and prospective employees for drugs and alcohol. The drug testing must be done during work time and the employer must pay for the testing. If a test is failed, a second test shall be administered. If both come back with positive results, then discipline actions may be taken. The goal of this legislation is to make the workplace safe for all employees. This bill was passed in the House and sent to the Senate for further consideration. House Bill 3009 would grant the Office of Health Facility Licensure and Certification access to the Controlled Substances Monitoring Program database for regulatory purposes. The bill was passed in the House and sent to the Senate for more consideration. House Bill 3061 would encourage a limited cohort of schools to implement mastery-based education through the Innovation In Education program. The Department of Education is given a range of duties from the identification of barriers and potential solutions to developing an incubator process to support schools awarded an Innovation In Schools/Mastery-Based grant. The schools must meet the same requirements and accountability as other Innovation In Education schools. This bill was passed in the House and sent to the Senate for more consideration. House Bill 3089 would provide a transition to the county board of education level of the process for review and adoption of instructional resources required to be used in the schools under the jurisdiction of the county board. This bill was passed in the House and sent to the Senate for more consideration. House Bill 2827 would update the all payor claims database. This bill was passed in the House and sent to the Senate. It is now in Senate Health and Human Resources. House Bill 2840 would reorganize the departments, agencies and commissions within the executive branch of state government. This bill was passed in the House and is currently in Senate Government Organization. House Bill 2856 would declare public policy and legislative intent for improving the marketing, quality and frequency of passenger rail service of the Cardinal Passenger Train. This bill was passed in the House and is now in Senate Finance. House Bill 2402 would create a special procedure for a person in possession of an abandoned antique vehicle to apply for and receive title to the vehicle and to create a procedure for the DMV to search for the owner of the vehicle to provide notice of an application for the title to the vehicle. The bill was passed in the House and is now being reviewed in Senate Government Organization. House Bill 2471 would require that on and after January 1, 2018, insurance coverage for breast cancer screening be provided by the Public Employees Insurance Agency, accident and sickness insurance providers, group accident and sickness insurance providers, health care corporations, and health maintenance organizations. This bill was passed in the House and in some being reviewed in Senate Banking and Insurance. House Bill 2637 would extend the time a retired teacher could work as a substitute teacher post-retirement limit in areas of critical need and shortage to June 30, 2020. The bill also adds speech pathologists and school nurses under these provisions. The bill was passed in the House and is now being considered in Senate Education. House Bill 2738 would provide more flexibility in the employee transfer process. It would remove the April 1 deadline for notifying the employee that he or she is being considered for a transfer. It would require a statement of reason for the transfer. The bill was passed in the House and is now being considered in Senate Education. House Bill 2767 would authorize the Secretary of State to transmit electronic versions of undeliverable mail to the circuit clerks of the state to minimize agency costs and streamline processes for the state. The bill was passed in the House and is now being reviewed in Senate Government Organization. House Bill 2797 would clarify that there is statutory immunity for government agencies and officials from actions of third-parties using documents or records of governmental agencies for unlawful acts. The bill passed in the House and is being considered in Senate Judiciary. House Bill 2798 would clarify provisions relating to candidates unaffiliated with a political party as it relates to certificates of announcement, preventing potential candidates registered as members of a political party from using the provisions of the section to seek candidacy for office. The bill passed in the House and is being considered in Senate Judiciary. House Bill 3030 would clarify that appeals to the Supreme Court are a matter of right and that every party has an opportunity to be heard. The bill passed in the House and is being considered in Senate Judiciary. House Bill 2833 would describe specific categories of information that must be included in the annual report of each professional licensing authority established in Chapter 30 of the West Virginia Code. This bill has passed in the House and is now pending in Senate Government Organization. House Bill 2898 would authorize the Joint Committee on Government and Finance to request and obtain criminal background information about prospective employees of the Legislature. The bill passed in the House and is being considered in Senate Judiciary. House Bill 2916 would authorize supervising entities to authorize reserve deputies, ambulance crew members, firefighters, rescue squad members and emergency service personnel to carry firearms. It specifies the training required for them to be eligible to carry a firearm and allows them to be reimbursed for the cost of the training. The bill passed in the House and is being considered in Senate Judiciary. House Bill 2180 would authorize the issuing of special “In God We Trust” license plates for a $10 fee, as well as special “Friends of Coal” license plates. The bill passed the House and now will go to the Senate for more consideration. House Bill 2208 would allow counties and municipalities to establish a joint airport hazard comprehensive plan for the purpose of satisfying requirements of federal aviation law, protecting the public safety or preventing hazardous conditions. This is to help with safety with takeoff and landing. The bill passed in the House and will now got the Senate for more consideration. House Bill 2366 would require the selling of Jackie Withrow Hospital by the Secretary of the Department of Health and Human Resources. Currently, the state owns seven long-term care facilities. The Department of Corrections uses part of the building. Delegate Nelson said this bill allows the Secretary of DHHR to look into selling the facility and most importantly, where to relocate the residents. Delegate Bates stood to educate the House about Jackie Withrow. She was a member of the House of Delegates and the first woman to chair the Health and Human Resources Committee. If passed and the hospital is closed, there is a special revenue account to be known as the “Jackie Withrow Long Term Care Facility Development Fund.” The bill passed in the House and will now got the Senate for more consideration. House Bill 2475 would require the Auditor and other state, county, district or municipal officers to certify to the Tax Commissioner the identity of payees prior to issuance of payments, and authorize the Tax Commissioner to identify those payees who are not in good standing with the Tax Department and to require the Auditor or issuing officer to forward to the Tax Commissioner the lesser of the amount of tax interest and penalty owed or the remaining amount of payment. The bill passed in the House and will now got the Senate for more consideration. House Bill 2494 would provide that statewide school report cards are only to be made available to custodial parents and guardians of students upon request instead of automatically being sent to the parents and guardians. The bill passed in the House and will now got the Senate for more consideration. House Bill 2524 would improve the focus on school-level continuous improvement processes led by the principal. The instruction must include the standards for high quality schools, the school accreditation process and strategic planning for continuous improvement. In the bill, school systems are given the flexibility to establish their own systems of support and supervision of beginning principals and the current state mandated programs and processes are eliminated. The bill passed in the House and will now got the Senate for more consideration. House Bill 2679 would prohibit county park commissions from prohibiting firearms in their facilities and to clarify that a firearm may be carried by a person for self-defense in state parks, state forests and state recreational areas managed by the Department of Natural Resources. The bill passed in the House and will now got the Senate for more consideration. House Bill 2702 would excuse students from school for a family member’s illness provided an in depth excuse is provided by a doctor with a reason of why the student needs to be home with the family member. The bill passed in the House and will now got the Senate for more consideration. House Bill 2709 would authorize the City of South Charleston to levy a special district excise tax for the benefit of the South Charleston Park Place Economic Opportunity Development District. This would allow for a road expansion and development opportunities for an 80-acre pond and tech park. The bill passed in the House and will now got the Senate for more consideration. House Bill 2734 would authorize a method for the collection and remittance of property taxes related to dealer’s heavy equipment inventory. The bill passed in the House and will now got the Senate for more consideration. House Bill 2774 would allow aircraft and aircraft parts to be taxed at the same rate as aircraft property. The bill passed in the House and will now got the Senate for more consideration. House Bill 2805 would declare certain claims against the state to be moral obligations of the state and to authorize payments therefor from the following funds: General Revenue Fund: $ 624,388.72, State Road Fund: $828,710.52, and Special Revenue Funds: $ 458,733.53 for a total of $1,911,832.77. The bill passed in the House and will now got the Senate for more consideration. House Bill 3093 would establish Broadband Enhancement and Expansion Policies. The bill would authorize the establishment of cooperative associations for the purpose of obtaining internet services. The bill passed in the House and will now got the Senate for more consideration. Senator Mark Maynard talks with Senator Ron Stollings before the Senate floor session.